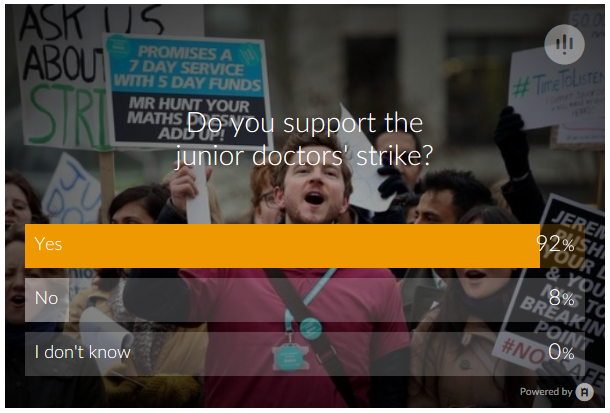 Poll: Do the public support the junior doctors? As was witnessed at the ongoing (7/4/2016) junior doctors' strike at St Helier Hospital, (which you can read about here) the public passing by on foot and on the road seem to be overwhelmingly in support of our great junior doctors. ITV are currently running a simple Yes / No / Don't know poll on their website. You can place your vote by clicking here. While the poll is not finished, and only represents people who've happened to visit the website to express a preference, and of course the results are not final yet, the snapshot below seems to reflect the proportion of the public who we saw supporting the junior doctors at St Helier during Wednesday's industrial action.